« Memoir ’44 Open de France, 5th Edition – And the Winner is… Arnaud ‘Grozours’ Péron! In Relic Runners you are a fearless Explorer, traveling the jungle in search of lost temples full of forgotten treasures and relics. Armed with nothing more than your trusty Pith Helmet and a nose for rare antiquities you’ll explore Temple Ruins and Shrines and undertake Expeditions in a race to unearth the most treasure! Designed by newcomer Matthew Dunstan, Relic Runners is a new large-format board game. Players follow trails across the jungle board map as they explore stacks of temples and ruins, ultimately hoping to uncover precious relics and earn victory points. Players work to efficiently manage their resources: building pathways; making sure to carry sufficient Rations; and expand their Explorer’s Toolbox to help them explore, resupply, take additional actions, and score bonuses. Skillful planning will lead to a successful expedition as they travel their pathways to capture valuable relics. 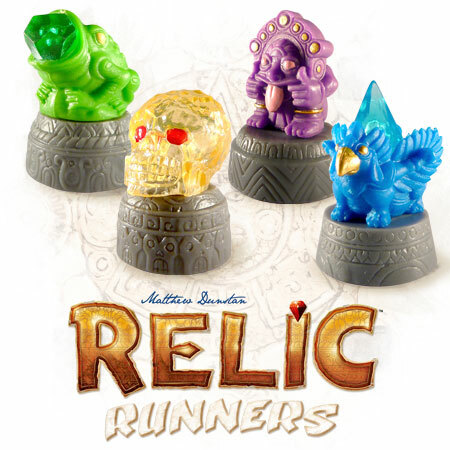 Relic Runners features a richly-illustrated jungle board map and beautiful Temple and Ruins tiles, plus 20 highly-detailed Sculpted Relics. For 2-5 players, ages 10+, it takes approximately 40-80 minutes to play. Relic Runners is expected to be available worldwide in September, at a retail price of $60/€50. 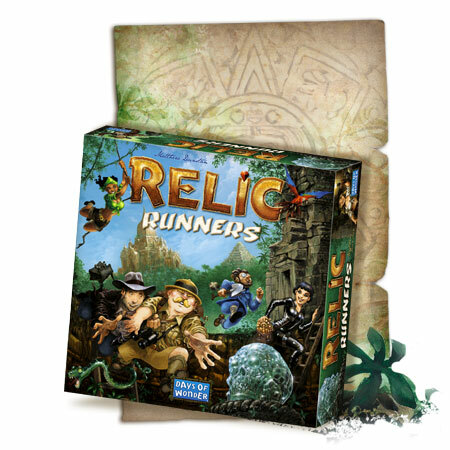 You can see more details on what’s Inside the Box; meet Relic Runners designer, Matthew Dunstan; or download Relic Runners goodies at the Relic Runners web page. This entry was posted on Tuesday, June 18th, 2013 at 14:37 and is filed under Divers, Games, News. You can follow any responses to this entry through the RSS 2.0 feed. Both comments and pings are currently closed. Is there any way we could get a bigger picture of “inside the box” on that web page? That image is kind of small and you cant click it to open it. When will we be able to see some images of the actual full game components? Not just the four pieces that have no real meaning right now other than being very beautiful plastic figurines but the actual board and any other pieces like cards or tokens or even the rule book? So far I am intrigued by this description but it means absolutely nothing to me from a “Will I but this?” stand point. This game sounds pretty awesome! I think that Dunstan chap sounds like a winner – definitely one to watch. Looks soooo nice. Looking forward to playing it.